It's estimated that about 40 percent of foodborne illness occurs in the home. Avoid the risks by following our safe food advice – and learn what symptoms to look out for with the worst bugs. Follow these precautions when you're dealing with food. If you make them the night before, store them in the fridge. Use insulated lunchboxes for sandwiches containing meat, fish, egg, mayo and other creamy fillings. Freeze a drink bottle or juice carton and pack it in the lunchbox to keep food cool. It will defrost by lunchtime. Keep dirty vegetables away from other ready-to-eat foods, or wash them before putting them in the fridge. Keep your fridge temperature between 2°C and 4°C. Check the temperature of your fridge (especially if it's old) with a fridge thermometer, available from hardware stores. Put it in a glass of water in the fridge and read after eight hours. Replace poor seals - they stop a fridge from maintaining its temperature. Don't jam in the food. Air should be able to circulate, to maintain an even temperature. Keep raw meat in the chiller or on the bottom shelf, separate from other raw and ready-to-eat foods. Defrost food in the fridge, not on the bench. Avoid drip thaw getting onto other foods. If you defrost food in the microwave, cook it straight away so it doesn't sit at room temperature. Keep foods in the fridge covered with cling film or in containers with lids. Cool hot foods covered - but for no more than two hours before putting them in the fridge. Marinate meat in the fridge. Pay attention to food storage instructions and use-by dates. Use separate chopping boards, knives and other utensils for raw meat and fish and cooked, ready-to-eat foods. Alternatively, clean them thoroughly between tasks. Treat all raw chicken as if it carries food-poisoning bacteria. Keep it wrapped and separate in the fridge, and wash your hands, knives, chopping boards and anything else it touches with soap and hot water. Even one drop of raw chicken juice can make you sick. Wash all fruit and veges before making salads. Wash your dishcloth regularly and microwave a damp dishcloth at least every day for one minute on high to kill any bugs. Keep food in a chilly bin with frozen slicker pads until you're ready to cook and/or eat it. Wrap raw meat securely so meat juices don't contaminate other food. Cook minced meat and sausages until steaming hot right through. Pork and poultry juices should run clear. Use a meat thermometer to check temperatures. Use separate tongs for raw and cooked meat. Boil marinades you've used for raw meat before serving with cooked meat. Keep hot foods hot and cold foods cold - don't hold foods at room temperature in the "danger zone" (5°C to 60°C). Chill all perishable foods like cooked vegetables, luncheon meats and potato salads until you're ready to serve. Eat food as soon as possible after it's cooked, and keep food in the shade. Bin perishable food that's been left out for more than two hours. Throw out refrigerated leftovers after 2 to 3 days. Don't refreeze leftovers a second time. Reheat until steaming hot inside. Don't reheat more than once. Microwaves tend to cook unevenly. Stir during cooking. Don't rely on bubbling - it may mean only part of the food is hot enough. If food smells bad, that's a sure sign it's gone off. But if it doesn't smell, don't assume it's fine. Wash hands with soap and hot water for 20 seconds, then dry them for 20 seconds on a clean dry towel or paper towel. Hands that are washed but not dried can spread more bacteria than unwashed hands. 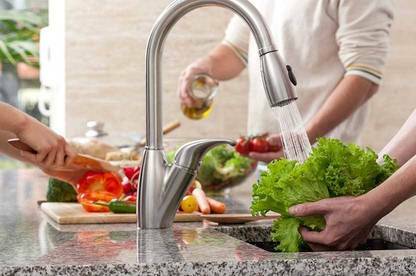 Wash hands before preparing or handling food, and after handling raw meat, poultry, or vegetables with soil on them. Washing hands is also vital after going to the toilet, gardening, handling pets or pet food, and changing nappies. Do food shopping last and go straight home. In hot weather use a cool bag or chilly bin for perishables. Unpack perishables first and get them into the fridge as soon as possible. The most common cause of foodborne illness in New Zealand. Risky foods include undercooked poultry, untreated water and unpasteurised milk. Symptoms include stomach cramps, muscle pain, headache, nausea, diarrhoea (sometimes with blood) and fever. Campylobacter can strike up to 10 days after you eat contaminated food, and effects will usually last for several miserable days. Risky foods include raw meats, poultry, unpasteurised milk and dairy products, seafood and some fresh produce. Wild birds or their droppings, and untreated drinking water are also risk factors. Salmonella is easily spread from person to person and through food. Symptoms include diarrhoea, headache, abdominal pain, nausea, fever and vomiting. It usually develops within two days. In recent years 11 percent of reported salmonella cases in New Zealand have been admitted to hospital. E. coli 0157 or VTEC produces a toxin that can destroy red blood cells and damage the kidneys. Risky foods include undercooked minced meat, unpasteurised milk products, unpasteurised juice and contaminated drinking water. Not washing and drying hands properly and swimming in sewage-contaminated water are also risky. If you use tank water it should be filtered and treated, or boiled for three minutes. Symptoms include acute gastroenteritis, watery then bloody diarrhoea, kidney failure and occasional vomiting. It usually develops within 8 days. Around 40 percent of VTEC sufferers need hospital care, and two to three percent die. Children under five, the elderly, and people with weak immune systems are at greatest risk. Listeria is common but especially dangerous for the elderly and pregnant women. It can cause miscarriage or stillbirth. Cooking destroys listeria but, unlike other bacteria, it will grow on food in the fridge. Symptoms include mild fever, headache, nausea, vomiting, aches and pains in the joints and muscles, or flu-like symptoms.